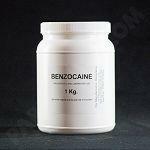 Benzocaine is a local anesthetic commonly used as a topical pain reliever or in cough drops. It is the active ingredient in many over-the-counter anesthetic ointments such as products for oral ulcers. It is also combined with antipyrine to form A/B otic drops to relieve ear pain and remove earwax. 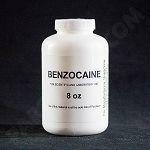 Benzoacine offered comes in various sizes which include: 1oz, 4oz, 8oz, 16 oz, and 1 Kilogram quantities.